The patch helps prevent cell death and repair damaged tissue. We know that cell therapies can help damaged hearts heal, but getting the cells to integrate with the blood-pumping organs has been a challenge — often, the heart tissue doesn’t fully retain the cells. Now, an international team of researchers thinks it’s found a solution: a tiny patch covered in microneedles that deliver cardiac stromal cells directly into heart tissue. To see if their patch might be an improvement on existing delivery methods, such as direct muscle injection or intravascular infusion, the researchers tested it on both rats and pigs, a process they describe in a paper published in Science Advances on Wednesday. First, they induced the animals to have heart attacks. Then they placed versions of the patches containing cardiac stromal cells directly onto some of the animals’ damaged hearts during open-chest surgery. When they later examined the animals’ hearts, they found that those of the rats that received the patches exhibited less cell death as well as the development of new heart tissue. Meanwhile, the treated pigs’ hearts pumped out more blood than the hearts of untreated pigs. Before testing their patch in humans, the researchers want to replace its polymer base with something that will dissolve in the body, researcher Ke Cheng told Science News. They’re also hoping to figure out an implantation method that wouldn’t require open-chest surgery. Of course, success in animal testing doesn’t always indicate that a treatment will work in humans. 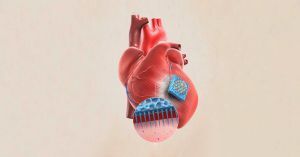 Still, if the patch does produce the same results in human trials as it did in animal ones, the tiny device could one day be a game-changing — and potentially life-saving — cardiac therapy. Editor’s Note 11/30 at 10:45 AM ET: This article has been updated to correct the type of surgery needed to implant the device, as well as to clarify that the cells involved in the research were cardiac stromal cells and not cardiac stem cells.